Lettuce wraps are great because they're a healthier taco alternative. For these, a mixture of soy sauce (or gf tamari which I used), hoisin sauce and rice vinegar elevates sauteed onions, garlic, mushrooms and carrots with Asian flair. Toss in some shredded chicken breast and green onions and you've got a flavorful filling. To save time, use a store-bought rotisserie chicken and debone, using the meat for the filling. The original recipe included water chestnuts and pickled ginger which I omitted - but feel free to add them along with other things to suit your tastes. Rinse whole lettuce leaves and pat dry, being careful not tear them. Arrange leaves on a serving platter and set aside. In a medium skillet over high heat, add 1 tablespoon of oil. When hot, add onions, garlic, and mushrooms cooking until softened. Add soy sauce, hoisin sauce, and rice vinegar to the skillet and stir. Stir in diced carrots and shredded chicken; continue cooking for about 2-3 minutes until chicken is heated through. Add green onions and sesame oil; toss to combine. To serve, allow each person to spoon a portion of the chicken mixture into a lettuce leaf similar to making a taco. Wrap the lettuce around the chicken filling like a taco and enjoy! I guess I know what we're having for dinner tonight! And, yes, I've been spoiled by Chicago weather, too. I think this will go on next weeks menu! 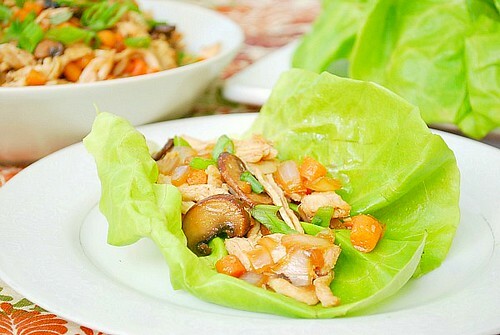 I already have a recipe for Asian chicken lettuce wraps, but this one seems lighter, and healthier. Can't wait to try them!